Aircel, India’s 5th largest GSM Mobile service operator, today announce the great initiative of Re-Use of old Mobile phone in association with Helpage India. Is your unused or old phone cluttering up your desk drawer? 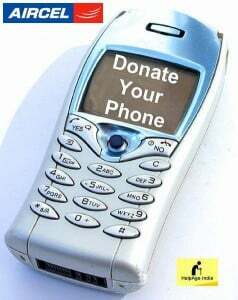 If you no longer need your mobile device, you may consider giving to some one who needs that with Aircel Donate Phone Program. With “Aircel Donate Phone Program” any one can donate their old working or non working phone to Aircel and it will hand over those phones to elderly citizens residing in old age homes with free talk time for one year.This simple act can bring a smile of joy to them and remove their loneliness.The old mobile Phones collected from all over India will then be checked, repaired and activated by Aircel and then handed over to Helpage India with free talk time for one year. To donate the old and spare mobile phone just by visit Aircel handset collection stores in Delhi, Mumbai, Kolkata, Chennai, Hyderabad and Bangalore (Bengaluru).The operator also set up Drop Boxes in Big Shopping Malls, Clubs, News Agencies and Aircel Retail Outlets where in the old / spare mobile phones can be dropped. Aircel Subscribers can SMS Donate Phone to 5800000 (toll free) for free pickup of the phone. Mr. Gurdeep Singh COO, Aircel said, “ We at Aircel our extremely sensitive to Corporate Social Responsibility and this festive season we encourage all to come forward and contribute by donating their old/spare mobile phones for the elderly in Old Age Homes . We are creating awareness by way of TVC’s, Print Ads and Digital Media to mobilize everyone for this cause”.